High street retailer BHS entered administration at the end of April – putting 11,000 jobs at risk in the biggest highstreet bust since the collapse of Woolworths in 2008. An ill-tempered post-mortem of the business is being played out in the press this month. The BHS story, noticed by 42% of British adults, has remained the most, or second most, significant business story for five weeks. Having sold BHS for £1 to Dominic Chappell’s Retail Acquisitions group in March 2015, Sir Philip Green, rejects responsibility for the company’s failure. He suggests that the responsibility lies with Chappell saying, "If I give you my plane, right, and you tell me you’re a great driver and you crash it into the first f***ing mountain, is that my fault?" However, the high street magnate is not off the hook. 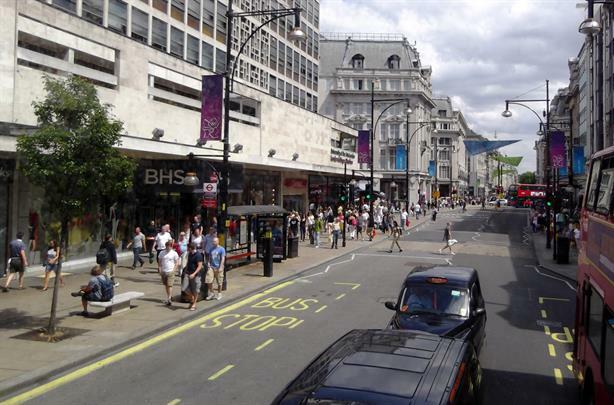 A joint Business and Work and Pensions select committee is investigating the role that BHS directors and advisers played before the retailer was sold. The Government’s Pensions Regulator, which has the power to pursue former owners of businesses if it thinks they have a responsibility to members of their schemes, has also launched a formal investigation. Though no conclusion has been reached, the story provides a good example of the ‘half-life’ of the biggest business news stories. While most businesses punch into public consciousness for only a short period, usually no more than a week or two, stories that dominate the business pages are invariably critical and tend to follow a similar pattern: (1) a high level of spontaneous recall when the story breaks, (2) weeks of declining visibility as people lose interest and (3) a spike in angry recall when new information pushes the story back into public consciousness. 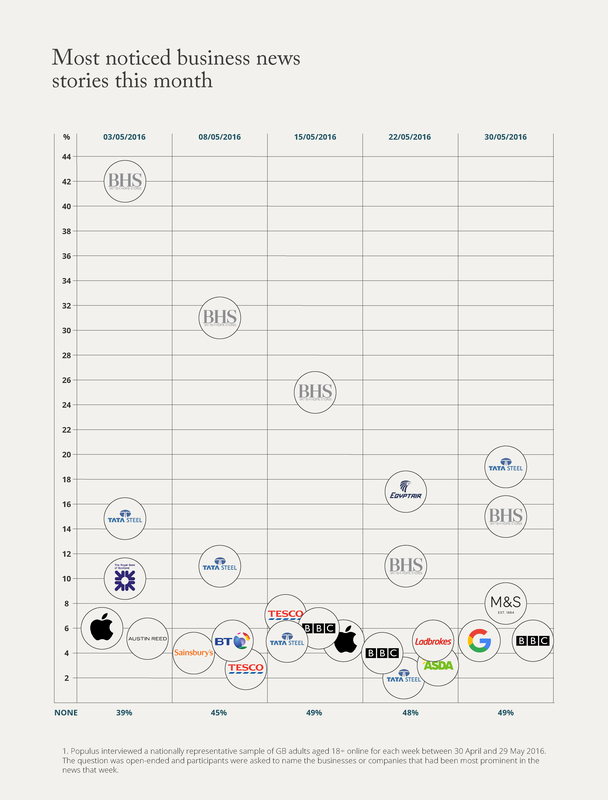 Three of the largest business stories of the last 18 months, HSBC helping wealthy customers to evade tax, Tata exiting the UK steel sector and BHS collapsing, demonstrate the typical progression of major business stories. It is clear that the agenda moves on and interest cannot be maintained as the story plays out over weeks and months. 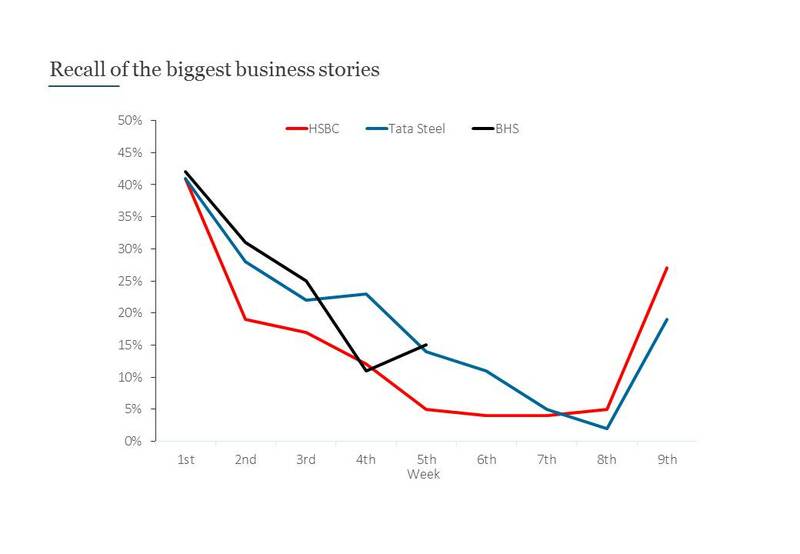 Businesses are inevitably bumped back into the news, often by tangential stories, as HSBC’s relatively innocuous domicile review and Tata’s routine shortlisting of potential buyers for its UK steel operations show. The result is that old wounds re-open and negative perceptions re-surface. Like aftershocks following an earthquake, these spikes in public consciousness tend to erupt again and again while the original issue remains unresolved. The beleaguered Royal Bank of Scotland (RBS) is an example of just how damaging these relentless aftershocks can be. Since its infamous bailout by the UK taxpayer in 2008, RBS, like most of its competitors, has been hit by IT failures, PPI mis-selling, and interest manipulation scandals. While the reputations of all banks are tarnished every time another example of banking misconduct is uncovered, RBS’s reputation has been hit the hardest and it is the slowest to recover. It has become the poster boy for bad banking behaviour because each time a new story emerges, people are reminded of the debt that the bank owes to the taxpayer and outrage is re-ignited. Companies like RBS, Volkswagen and Tata, which are likely to face periods of prolonged exposure to the ups and downs of the media cycle, must not ‘circle the wagons’ and wait for the media ‘aftershocks’ to come. They should take the temporary lulls in public attention as opportunities to pre-test and identify communication messages which limit damage to their reputations when unwelcomed media attention inevitably pushes them back into public consciousness. Identifying, preparing and introducing communication during these relatively quiet periods may not fix their damaged businesses, but it will limit the grinding erosion of their reputations that repeated negative media exposure engenders. Sometimes companies associated with tragic events are propelled into the news. On 19 May, the crash of EgyptAir flight MS805 into the Mediterranean Sea and the deaths of all 66 people on board is one such example. En route from Paris to Cairo, smoke was detected in the avionics bay shortly before the plane disappeared from radar without a mayday call. The plane has not yet been found nor has the cause of the crash been identified, but speculation that a terrorist attack may be to blame is rife. Egypt’s tourism industry, already damaged by terrorist activity, is bound to be further hit by this incident and questions will be asked about the airline’s security arrangements. But for now, EgyptAir is just the business associated with another major tragedy. Its reputation is unlikely to be damaged significantly by this incident.